The 11th Annual Independent Film Festival in New York, RUSDOCFILMFEST-3W, has concluded. Over three days, 21 documentaries were screened, all of which were produced by private film studios. Most of these films were made by Russian filmmakers but were produced in the United States, Bulgaria, Israel, Latvia, Poland, Russia, the Czech Republic, and Estonia. Fifteen of the films screened received their US premiere, and nineteen of the films were entered in the festival competition program. The festival took place at two locations: DCTV, and the School of Visual Arts. The festival received Greeting Addresses from Mayor Bill de Blasio and New York State Assembly member Steven H. Cymbrowitz. Our festival has likewise been honored with greetings from the entire Russian-speaking Diaspora of New York City. The general sponsor of the festival project is the private charitable fund, the Zimin Foundation. Seven directors and studio representatives have taken a direct part in this year’s festival. Festival guests included documentary filmmakers Jon Alpert – awardee of 16 Emmys and two-time Academy Award nominee, as well co-founder and co-executive Director of DCTV; Emmy Award winner and co-founder and co-executive director of DCTV, Keiko Tsuno; and artist Serge Hollerbach, a member of the American National Academy of Design. This year marks the artist’s 95th birthday, and an exhibit of his works, from his private collection, constituted part of our festival. In honor of his 95th birthday, Serge Hollerbach was presented with an honorary New Review Corporation Diploma, celebrating his contribution to the development of world culture in the 20th century, and a “Gold Medal” presented by the Pushkin Society of America. Moreover, presentations by contemporary New York artists and poets constituted part of the festival, including the art installation “59. Alphabet Diet. Dishiza” by Russian-American performance artist Irina Danilova, and presentations by artists Eduard Beckerman and Irina Danilova. With the support of the “Free Word” Independent Association (Russia), The New Review Inc. held an exhibit of photographs by the young Russian cameramen Kirill Radchenko (1985-2018), who was killed this summer in the Central African Republic, while working on a new film project. On October 19th, the poetry reading series “Accents of New York” took place as part of the festival, and featured American poets Karmen Firan, Anna Halberstadt, Andrey Gritsman, Helga Landauer, Irina Mashinskaya, Filipp Nikolaev, Daniela Petrova, Adrian Sangeorzan, and Grigory Starikovsky. The readings were organized by New York publications Interpoezia and The New Review. The festival likewise featured two roundtable panels: Beyond the Borders: Women in Contemporary Documentaries and Visual Arts; and The Documentary Filmmaker’s Prime Responsibility: Social, or Artistic? Beyond the Borders featured a presentation by American filmmaker Keiko Tsuno: “50 years in American Documentary Film”, and included a screening of her film “Story of Vinh”, the screening of two films by young directors: Sarah Khaki “Facing the Mirror” (USA), and Lydia Sheynina “Harmony” (Russia). Participants of the panel discussion were: Helena Goscilo, Ohio State University – author of well-known works on the problems of the women’s movement; Lucy Kostelanetz – director, Vice-President of the Flaherty Seminar (USA); Nadezhda Azhgihina – Vice-President of the European Federation of Journalists, co-founder of the Free Word Association, and the Russian Independent PEN; Mary Dore – producer and author of “She is Beautiful When She is Angry” (USA); and Keiko Tsuno – filmmaker and director of DCTV (USA). The Documentary Filmmaker’s Prime Responsibility: Social, or Artistic? featured American filmmakers and producers Pola Rapaport, Brad Rothschild, Micah Fink, and David Sampliner. The online festival campaign was viewed by people worldwide, including the United States, Russia, Israel, Great Britain, Ukraine, Canada, Brazil, Germany, France, and Greece. According to Google, 62% of viewers were women, and 36% were men. 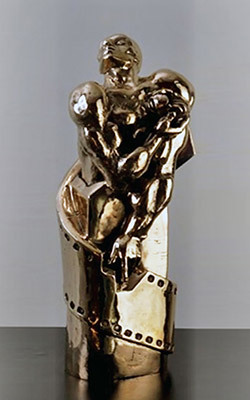 The festival jury consisted of: Vitaly Komar – artist, and one of the founders of the SotsArt movement; Lucy Kostelanetz – filmmaker, and ex-president of the Flaherty Seminar; Anthony Anemon – film historian; and Jeff Bliumis – sculptor, and executor of the festival’s Grand Prize (based on the graphic of the festival’s logo, by Ernst Neizvestny). The main emphasis of the festival program was based on works that reflect the main problems facing society today: those of a socio-political nature, armed conflict, problems of democracy, freedom of speech and human rights, problems of the civil rights of women and the rights of people with limited capabilities; as well as problems of the artistic freedom of the writer, and problems of remembering the Holocaust in the 21st century. A significant number of films were also dedicated to contemporary Russian culture. For her contribution in the “Russian culture to the United States” category, a diploma goes to director Irina Vasilieva, for her cycle of film essays about the philosopher Grigory Pomerantz. The New Review Corporation presents the Humanitarian Award to director Oleg Mavromatti, from Russia, for the staunchly anti-war film Monkey, Ostrich and Grave. “In recognition of outstanding contribution to international documentary filmmaking” category: American documentary filmmaker Keiko Tsuno.